The trio sonata was one of the main forms of instrumental music in the Baroque period. Numerous pieces of this kind - scored for two melody instruments and basso continuo - were produced from the last quarter of the 17th century to the third quarter of the next. It was a bit different with the quartet. This genre was considered the ultimate proof of a composer's mastery of counterpoint. In his treatise Versuch einer Anleitung, die Flöte traversiere zu spielen, Johann Joachim Quantz described the quartet as a sonata with three concertante instruments and a bass line that is "at the same time the touchstone of an authentic contrapuntist and also a real pitfall for a musician lacking experience and compositional skills". In his view Telemann was a specimen of the first category. His quartets could be used "as excellent models for this type of music". 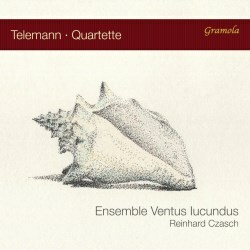 Telemann's oeuvre includes a considerable number of quartets; the catalogue of his works includes more than 60 extant pieces of this kind, and to them one has to add the pieces which are known to have existed, but which have been lost. They appear under different titles: quatuor, sonate and concerto. The scoring is also different, such as transverse flute, violin and viola da gamba, transverse flute, viola da gamba and bassoon or two violins and horn - to mention only a few. The present disc offers four quartets from various sources in different scorings. In 1733 Telemann published the three Productions of the collection Musique de table. Each of these volumes included an 'orchestral' suite, a quartet, a trio sonata, a solo sonata, a concerto with two or three solo parts and a 'conclusion'. The present disc includes two of the quartets in this collection. The Sonata in D minor is from the second production and - as was so often the case in music for amateurs of the time - offers various alternative scorings. Two of the melody parts are for transverse flutes, but for the third the performers can choose between the recorder, the bassoon and the cello. The Freiburger Barockorchester, in its complete recording of the Musique de table (Harmonia mundi, 2010), chose the second option, here we get the first. At the time this collection came from the press, the recorder was already a rather old-fashioned instrument, but still popular among amateurs, which explains why Telemann composed many pieces for it. In contrast, the flute was the most fashionable instrument of the time. In this sonata Telemann treats the instruments in various ways: on the one hand the three instruments are fully integrated, in line with the requirements of counterpoint, but especially in the second movement he juxtaposes the recorder and the pair of flutes. The performers highlight this aspect by including a cadenza for the recorder, a practice, which I find debatable. The other quartet from this collection is taken from the first production. The Sonata in G is for the more 'conventional' scoring of transverse flute, oboe and violin. Susanne Abed-Navandi, in her liner-notes, states that "[the] popularity of that piece among the interpreters of the early music scene may possibly come from Telemann's idea to group the central upper voice instruments of a Baroque orchestra (...)". The scoring may be conventional, the structure is not: the sonata has the usual four movements in the most common order - slow, fast, slow, fast - but Telemann derives from it in that the two first movements have an ABA structure; the B section is in a contrasting tempo. The third movement is very short (here 00:48) and not more than a transition between the two fast movements. The most famous of Telemann's quartets are those generally known as the 'Paris' quartets. Strictly speaking that title is only appropriate for the quartets Telemann composed during his stay in Paris in 1737/38 and were published there. In 1730 Telemann published a set of six Quadri; these are often also ranked among the 'Paris' quartets, probably because they are so much alike the later quartets, including the scoring for transverse flute, violin and viola da gamba. Here Telemann treats the instruments on equal terms, although he also highlights the flute. Telemann would not be Telemann, if he didn’t explore the different features of every single instrument. It certainly helped that he played most instruments himself and had an intimate knowledge of their characteristics. That is also the case with the Concerto in A minor, scored for recorder, oboe, violin and basso continuo. It ranks among Telemann's most popular pieces, probably especially because of the closing vivace, a typical exuberant movement, with which Telemann so often closes his sonatas. The programme on offer here is not exactly original. All the pieces are available in many recordings. The short playing time does not speak in favour of it, either. I don't quite understand why the performers did not add any further pieces from the rich oeuvre of Telemann. Fortunately the interpretations are mostly pretty good. Most of the tempi are satisfying, such as the andante, which opens the Sonata in D minor. However, the andante from the Sonata in A seems too slow, more like an adagio. I have already expressed my doubts about the cadenza for the recorder in the Sonata in D minor. That said, this disc has given me much pleasure. Because of the variety in scoring, this disc is a fine introduction to the quartet repertoire in Telemann's oeuvre.